Jan Jaap Minnema of Fraser Yachts in Monaco contacts me to say that he's just signed a new central agency, the 33.3m megayacht Perla Nero. Jan Jaap sold her as Fansea in April 2009 to a first-time buyer who, "likes the yachting world so much that he wants to move up to a bigger yacht." Built by Cyrus Yachts in 2007 to RINA class and MCA compliant, Perla Nero sleeps 10 guests in five cabins including an owner's suite on the main deck and cruises at 15 knots. 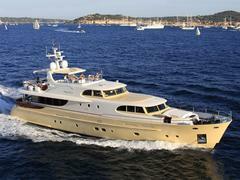 Currently lying in Croatia, the megayacht's asking price is €4.95 million.